Time for cider to get its turn in the Welsh Drink of the Month spotlight. 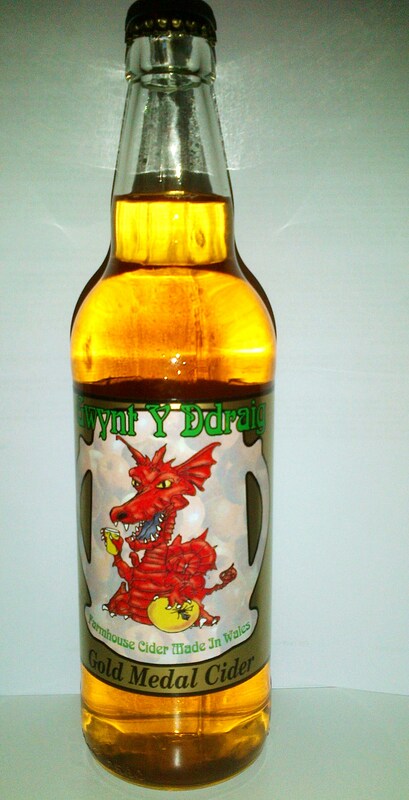 Gwynt y Ddraig is Wales’ biggest cidermaker and is at the forefront of the revival in Welsh cidermaking. They are based in Llantwit Fardre and got going in 2001. They use apples mainly from Welsh orchards supplementing them with imports from Herefordshire and Somerset. Gold Medal won the CAMRA Champion Cider award back in 2004 and is a blend of ‘bittersweet varieties with some of the true sharp varieties of cider apple. The cider is oak conditioned and is a medium cider. This entry was posted on 01/08/2013 at 21:42 and is filed under Cider, Drink of the month. You can follow any responses to this entry through the RSS 2.0 feed. You can leave a response, or trackback from your own site.